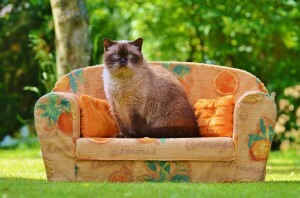 We have all seen the familiar view of our cats enjoying themselves up on a perch in your yard or in your home. Cats love their vertical territory! Their need to climb is deep-rooted, and can be traced back to their wild ancestors. These ancient cats instinctively searched for higher ground to assess their safety, and search for their next meal. Although we may discourage jumping and scratching in our homes, it is a basic need for all of our cats. For this reason, and many others, it is imperative that we provide our cats with places to jump, climb and lounge. Climbing is a great form of exercise when there are safe and tall places to explore. If you have several cat’s, multiple vertical places give them the space they need to enjoy some alone. This will also decrease stress. If you have multiple options, it may decrease territorial behavior. For owners who also have a dog in the household, it is important to provide place where only your cat can climb or hide. We are lucky that there are so many modern options for your home. Cat trees, condos and wall panels are special, because unlike the couch or bed, they only contain your cat’s scent. A perch that allows access to a window can provide hours of enjoyment for your indoor cat!